The simulation player can man all the positions on WWII bombers such as the Boeing B-17 Flying Fortress, Avro Lancaster and Junkers Ju-88. Few combat flight simulators of this time had this feature. In addition, other aircraft could be flown in the simulation including the Lockheed P-38 Lightning, North American P-51 Mustang, Supermarine Spitfire, DeHavilland Mosquito, Hawker Typhoon, Focke-Wulf FW-190 and the Messerschmitt Me-262. The simulation featured a mission editor that players could use to create their own missions. Fan websites created numerous modifications of flight theaters or eras (World War I for example), new aircraft and new missions. 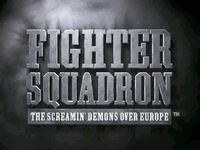 Source: Wikipedia, "Fighter Squadron: The Screamin' Demons Over Europe", available under the CC-BY-SA License.